Add selling power to your store with White Slatwall Gondola Units. Accessorize and organize your displays with these display merchandisers to catch the eye of shoppers as they pass. This designer display is fully customizable to fit almost any product. They allow merchandise stand out instead of being hidden by a distracting display medium. 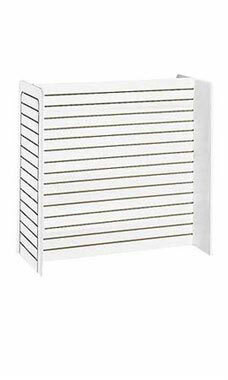 The Slatwall Gondola Unit is 48''L x 24''W x 48''H with a pristine white melamine finish. This unit and accessories are in stock and available for immediate shipment!